So, you want to build an oil cooler, but don’t want to pay $800 for a Blitz one? Don’t trust the $300 eBay special? Then build your own. All it takes is some patience, some cash, and a Summit parts magazine. 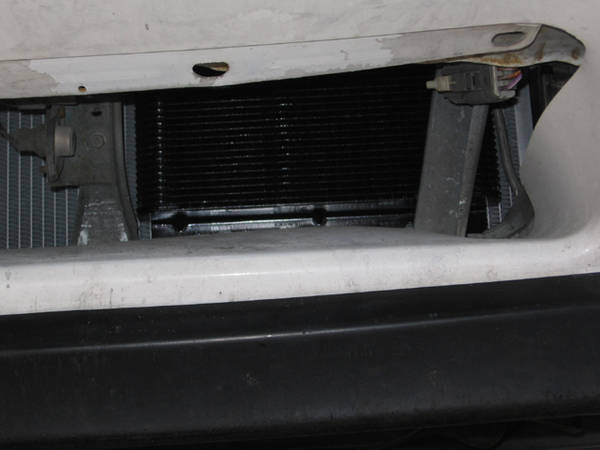 The basic idea is simple: add a front mounted, in line air cooler to the cars oiling system. This is both an easy task, as minimal parts are needed, but it can also destroy your motor if you do not attach everything properly or you do not tighten everything down well. Enough with the schpeil, let’s get to the how to. All of the parts are readily available from most parts warehouses, but since I ordered from Summit, I will be posting their parts numbers for easy copying of my kit. 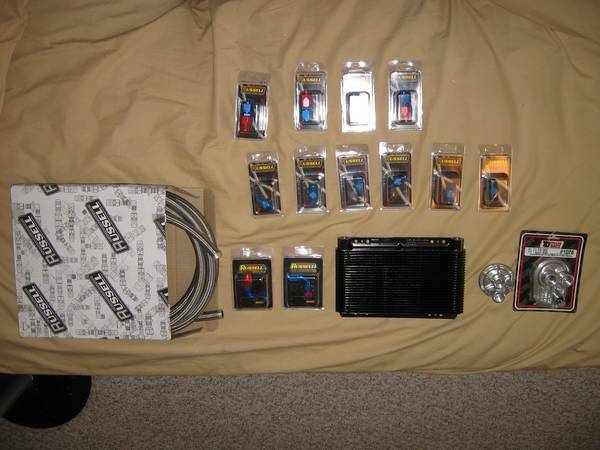 Head over to http://www.summitracing.com and get your credit card handy. 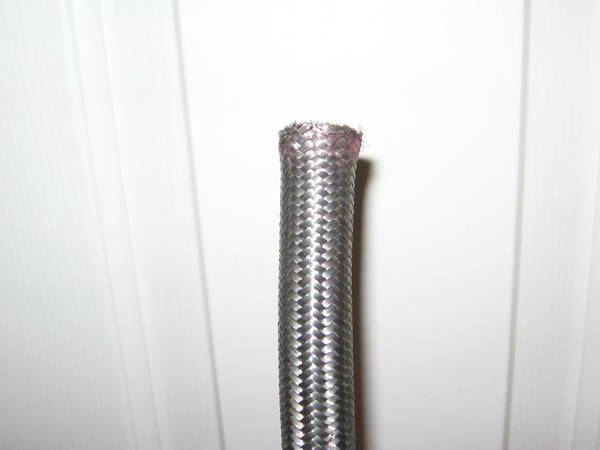 1.-10 Russell stainless steel hose RUS-632180 Now this comes with a caveat. This is the $91 15’ length. I have about 5’ left. Buy the ~$60 10’ length. 8.Oil filter. I took the filter plate into NAPA and said “Here”. What I got was a NAPA Gold 1515 for a late model Chevy pickup. It is HUGE. Once finished, I had a leak at both fittings on the filter plate. The stuff leaking out of the feed (from the galley) was blackish, the oil out of the filter was pure synthetic gold. This filter works!! Ok, another decision needs to be made. You need to pick where to mount the cooler and oil filter adapter. I chose to mount the cooler to the face of my radiator. You may want it in the front wing (inner fender), or out in front of the bumper ala old school JDM tyte method. The choice is yours. 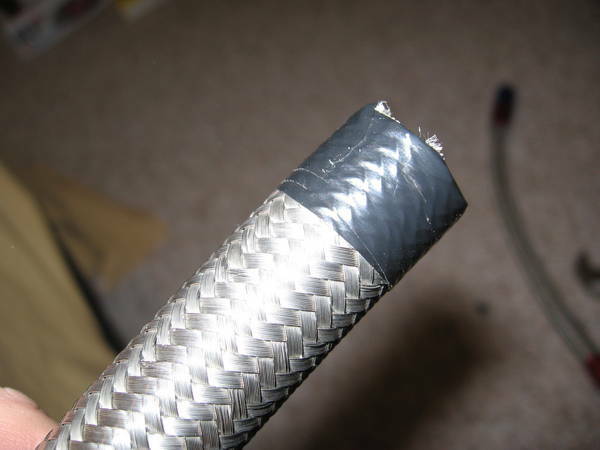 Here you need to cut the braided hose to the correct length. The hose will be about 1.5” inside the hose ends when assembled, so measure your exact lengths and add 3” to the overall length. Cutting braided hose is NOT FUN. Wear gloves. Even one strand can lay you open like nobody’s business. What worked for me was to measure the length with a heater hose (easier to bend, and equal in outside diameter to the braided hose) then used electrical tape, TIGHTLY stretched, to mark cutting location on the braided hose. Now, use a cut off wheel or a Dremel to cut in the middle of the tape. The tape is there to keep the strands from fraying. Now, after cutting, the tape is very frayed and possibly melted (side note, the braided hose is VERY easy to cut with a 12k RPM Dremel), so I removed the left over tape. Then, VERY carefully, I rewrapped the end as tight as I could with more electrical tape to be sure that the ends were perfectly round and unfrayed. Leave the tape in place for the next step. Here are my measurements. REMEMBER that mine is mounted in front of the radiator! If you go for a sidemount, the hoses will be considerably (~1’) longer!!! Ok, get your forearms ready!!! 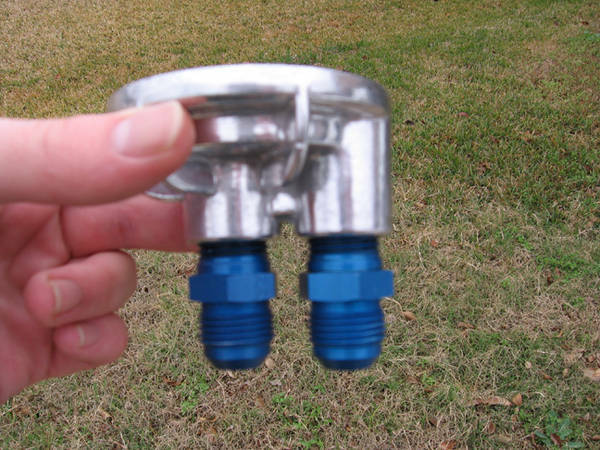 A/N end fittings are 2 piece compression fittings. Consider that a high temp, high pressure viscous fluid will be passing through these. Remember, there is no tight enough. These need to be as tight as you can humanly make them. Imagine romping on your car at an AutoX or drift day and suddenly losing all oil and pressure. Bye-bye bearings. Ok, there is a trick to this. I figured it out myself after 5-6 tries, but it works. The narrow side of the red piece slides over the end of the braided hose. It is threaded inside, so screw the hose until it reaches the second set of threads. There is a lip on the inside of the fitting where you should stop. Now, simply push the blue fitting into place. Notice that it is tapered? The taper should just slide into the inside of the rubber hose (very little force is needed) From here, begin screwing it into place. 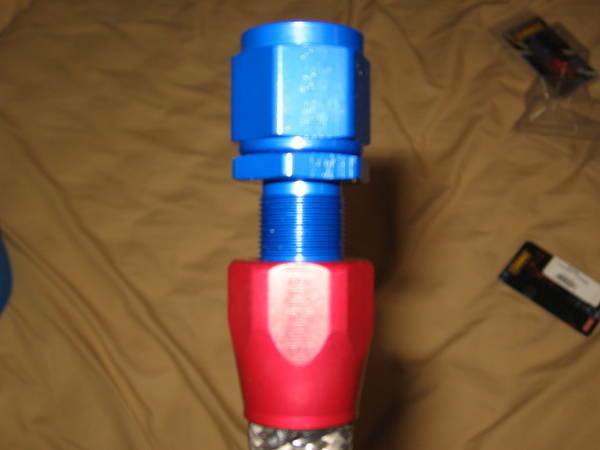 This blue fitting smashes the hose between the threads of the blue fitting and the “wall” of the red fitting. Tighten the fittings together by hand, making sure that the hose does not back out of the red fitting. Now, if you left the electrical tape in place, everything will slide together nicely, and as you tighten the red fitting, the threads will actually strip the electrical tape off. If you are entering a car show, use a knife to remove the tape boogers that will come out of the bottom of the fitting once tight. Once again, use either A/N wrenches (up to $100 a set) or 2 crescent wrenches to tighten the blue fitting as tight as possible. No threads on the blue fitting should be seen! 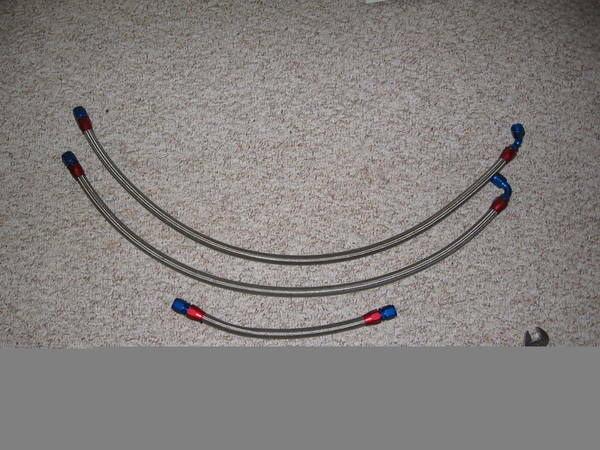 The 6” gets a straight -10 A/N hose end on each end, where as the cooler feed from the filter gets one 90^ at each end, and the return gets one 90^, and one straight end. Now, remember those 6 -10A/N to ½” NPT fittings? Go ahead and install them. They go in the filter plate, the engine block plate, and the cooler itself. 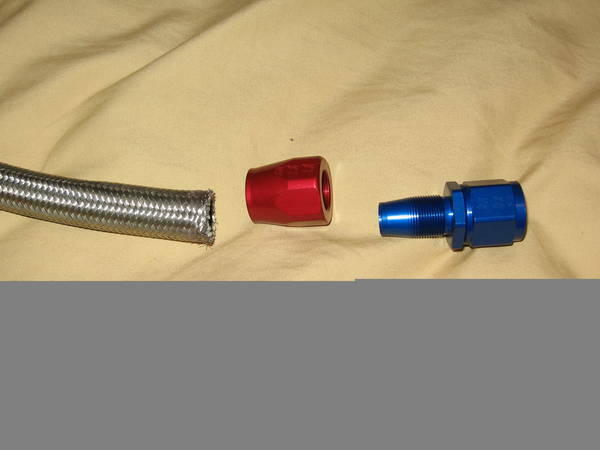 In my research, I found that threadlock on the hose end fittings is not needed, but here it is. I used Permatex Green Penetrating formula, as it is designed for preassembled aluminum fittings. Simply put a light coat on each fitting, and screw into the cooler, and both plates until tight. If you did all of this correctly, everything will be free of leaks and ready to rock! Now, comes the fun part! Get the front of the car in the air, pull the drain plug and filter, and let it sit for as long as you can stand. I used zip ties to mount the cooler. I went to Target and got a little box of machining nuts and bolts and some washers for the oil filter plate. This is kind of up to you. Mount the filter higher than the oil pan, and you are fine. Now, we need to have a little discussion here. Inside the filter, there is a valve that keeps pressure from building inside the filter until there is actual fluid inside it. This means, that on startup, the filter will act as a safety mechanism keeping oil pressure from dropping as the pump tries to fill the empty lines. 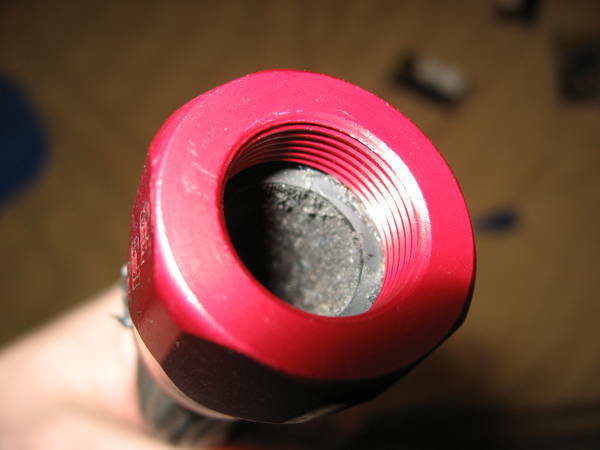 Instead, it will allow pressure to build behind the filter (in the engine) protecting your bearings. Now, that means that you don’t have to mount the filter upside down, but can actually mount it upwards, adding bling, cooling the filter, and making it very easy to change. Now, because pressure via a vacuum will build in the filter, when you go to remove it, the vacuum will be broken, spilling the oil contents from the filter. Simply drill or punch a small hole in the top of the filer before draining. This little trick is per the advice of a local open road racer (he runs a C4 Vette in the Big Bend Open). Now, the rest is pie. Simply screw on the fittings till tight. Well, it is not all that simple. I cut my lines so that there is as little slack as possible. REMEMBER: these are highly machined fittings. Make for damn sure that you have the threads lined up right, and do not tighten down until you do so, as the aluminum threads will cross easily, ruining a $10+ fitting!! You need to make sure that you have the feed and return plumbed correctly, or NO OIL PRESSURE WILL BUILD. Without a proper gauge, you could totally miss this, going for a test run, and getting towed home with rod knock. The flow goes into the “outside” of the filter, through the element, and returns to the oil gallery through the large diameter hole in the middle. Here are some pics to show hose routing. 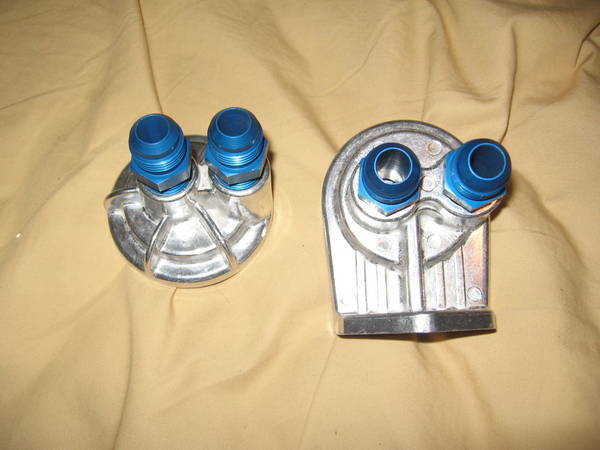 The inlet to the block from the cooler is the one that is more centered, seen here as the left most one. The one on the right is the feed to the filter. The same is true for the filter plate. The inlet to the filter is the hole that feeds the outer ring of the filter, out to the cooler is in the center of the plate. Ok, once everything is plumbed, make sure that all fittings are tight. Also, make sure that the block plate is as tight as can be. 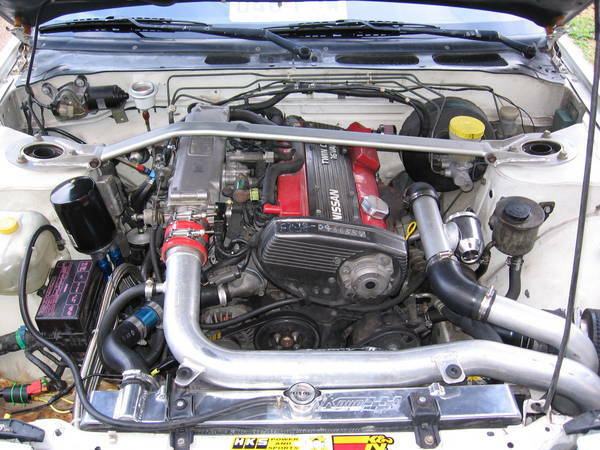 Sport Compact Car added one of these to Project Silvia, and on the test run, leaked oil from the filter block off plate. Also, remember that these lines will be transporting hot oil, so keep them away from any sensors or wiring. 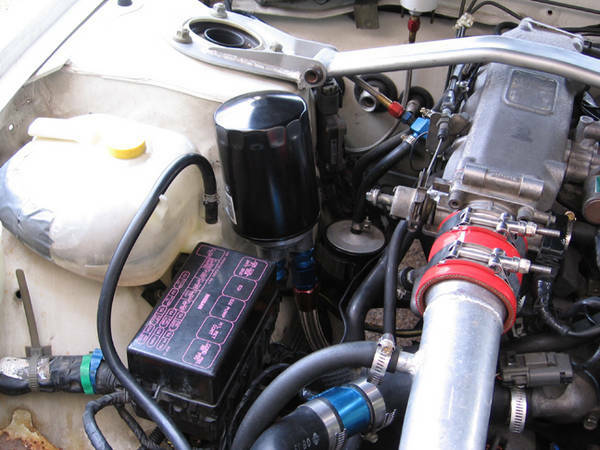 For the CA that I installed this on, oil capacity is around 4-4.5q now (standard is ~3.3q). Math shows that the lines should hold around 3/4q, the cooler should hold ½q, and who knows about the filter. Just buy 2 extra quarts, put the car back on the ground, fill, and check when warm. Check that all lines are warm. Check for leaks, and carry a wrench with you for your first few drives (my leaks were at the oil filter plate). Everything checks out ok, hit the track and forget about oil temps!! !